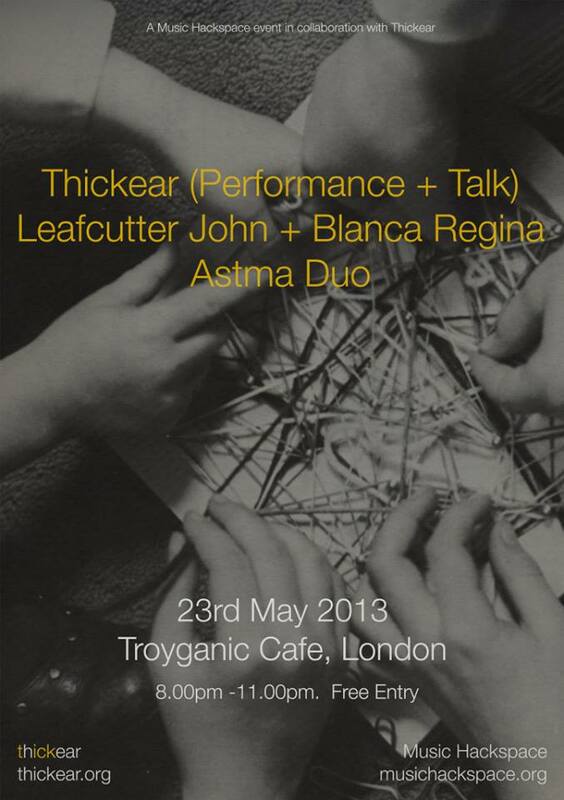 Thickear are a collective of sonic artists exploring sound through performance, technology and exhibition. Originally formed from Sound Arts M.A. alumni, Thickear’s live performance events combine individual and group works to examine a common theme or concern, often with imaginative, touching and funny results. Geoff Howse, Jack James and Kevin Logan will perform new and revised works, and will speak about making sound art with technology and how this shapes their own particular approach to each work. Leafcutter John and Blanca Regina will perform a set of live audiovisual improvisations, combining images, sound and texture in an electronic music jam. From the experimental Russian noise scene, ASTMA is formed by drummer and vocalist Olga Nosova and Russian industrial/electronic scene pioneer Alexei Borisov. Described as an act that tributes ‘too many different types of acoustic torture to even bother mentioning them’, ASTMA will be performing live electronic, acoustic, field recordings, and spoken word impro. This entry was posted on Thursday, May 23rd, 2013 at 03:46. You can follow any responses to this entry through the RSS 2.0 feed. Both comments and pings are currently closed.